Here's the speech that we wish the President had given last night -- not about sending more troops to Iraq but rather about more gold stars for our nation's schools. Via The Onion. "Vowing to give the nation's public schools "a much-needed boost," President Bush announced Monday that his 2003 budget proposal would allocate 1.5 billion gold-star stickers for education." 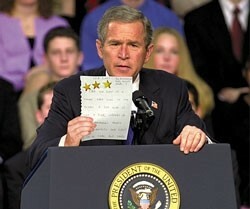 Caption reads: "Bush holds up a Dayton, OH, fourth-grader's gold-star-adorned book report on Ferdinand Magellan." Forty-six New York City schools have been newly identified as failing under the federal No Child Left Behind law!! based on their studentsâ€™ performance in the 2005-6 school year, the State Education Department said yesterday. I would like to compare various tutoring sites, such as Tutor-Vista, Vie-Nova, SchoolTrainer Tutoring, Tutor Easy and Tutor Next. Do you have any comparative data on this? that's a really good question, ganesh -- i have no idea if anyone compares them. you might try eschool news or DA or scholastic administrator for an article, or one of the state reports on SES providers.